Before Zengo opened its doors and Le Royal Meridien was still working on the then “new” road leading up to its entrance, the husband and I used to go cycling down that way quite a bit and wondered what was going on : all these wrapped-up trees and construction. January 2015 came, we had a peek at what they had to offer at their launch – loved it, and have returned a few times after – click here, and here. I’ll be honest, I never got around putting a piece together as I was just…. too lazy. So finally, here’s one, on our recent visit to Zengo to review their new menu, put together after their new chef Xiao Meng Liu joined the team, alongside Richard Sandoval. First off, lots of credits goes to the interior designer (and the team) for what they’ve done with Zengo (Note : Opinion is sort of biased as he is a friend of ours, ha!). Cream leather-clad couches indoors, wooden ceilings and a cosy bar area if you wish to dine and watch the chefs prepare your sushi. We chose to sit outside, and it seems like so did the rest of the guests as it was packed on a cool late October Wednesday evening. A scan at their new menu, shows a large selection of pan-asian dishes – from japanese (sushi, sashimi, tempura, robatayaki), to mains from the other eastern asian regions – nasi goreng, szechuan beef, kung pao prawns. Their grill options are a little more fusion – with bbq lamb ribs, and U.S prime tenderloin for those who want a bit more meat to their meal. Confused, we asked the staff to recommend a selection for us to try for the evening, and she was extremely thorough (honestly, felt a little bit too well-rehearsed!). 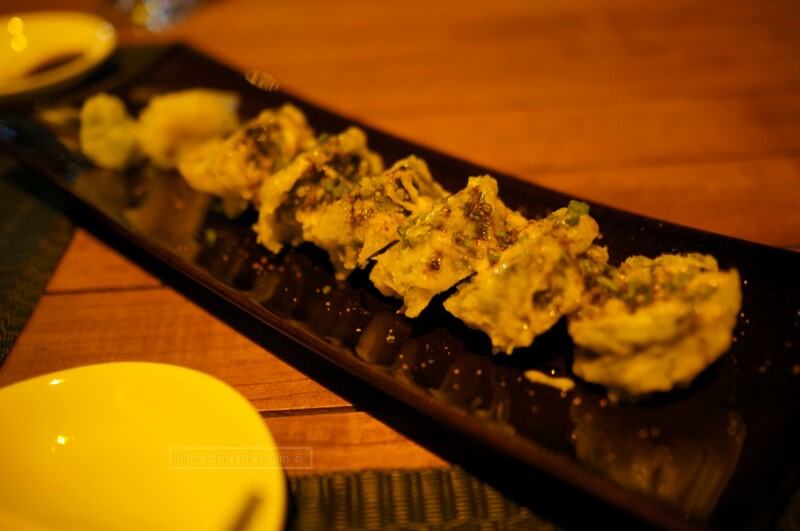 We started with a maki roll – the “new volcano” (70 AED), a combination of king crab, wasabi mayo, a touch of unagi (eel) sauce, fried in tempura batter. The wasabi mayo gave it just enough spiciness, though if you were on the more adventurous side, add a little more wasabi to it for the full nose-popping experience (as we do 🙂 ). 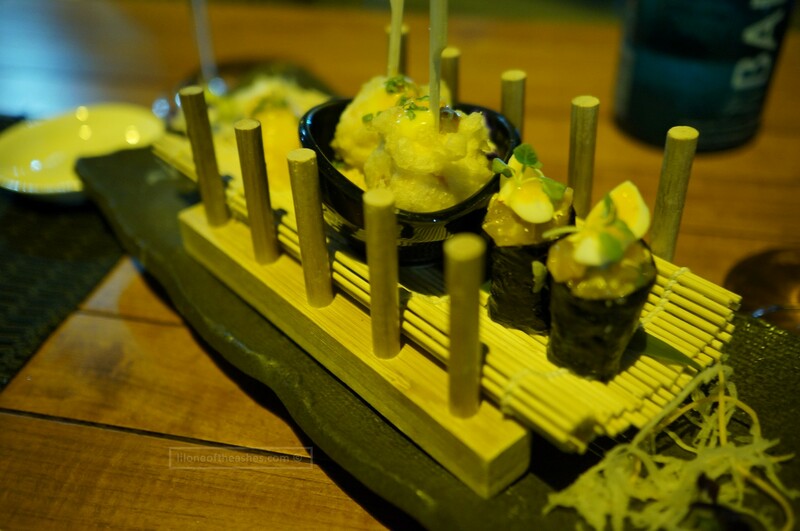 This was reminisce of the sushi rolls we have had in Rouge (click here for review), full of flavour in a perfect bite, and a generous amount as well! No japanese meal is complete (for us) without salmon, so the husband chose the salmon omakase (70 AED) – another large selection of salmon miso nigiri, fried sushi salmon, and gunkan salmon tartar – worth every bite. If you’re not too big on sushi’s in general, I would suggest to go straight to the omakase selections as they plentiful, and well-value for money. Hot starters, we went with the shrimp chicken gyoza (70 AED), put together with cherry tomatoes, thai basil and, surprisingly and quite interestingly, apple curry sauce. One to try. 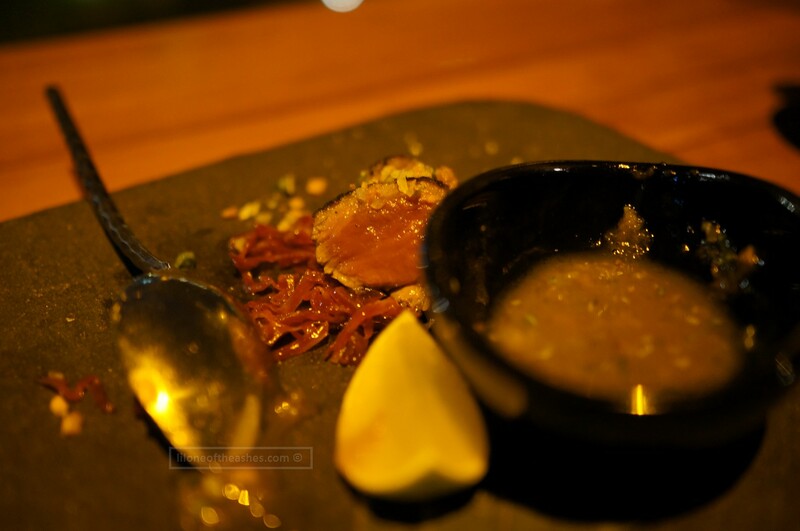 From the robatayaki, we had the beef short ribs (55 AED) which was served with onion tempura and, another innovative choice – korean barbeque sauce. We were loving it so far, little dishes put together with asian ingredients from near and far. 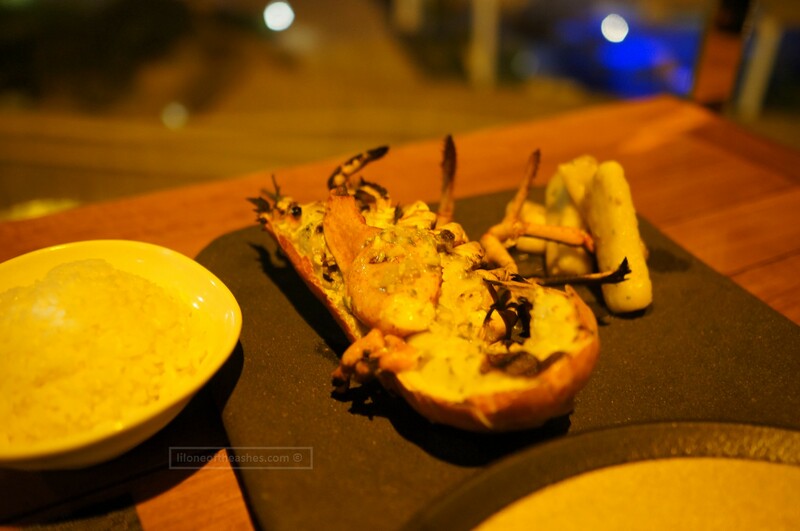 For mains we skipped the wok-fried choices and went for the grill – my half canadian lobster (245 AED) was a simple dish served with garlic butter, and fried fermented cassava. Though sweet and juicy, this was not amazing. I felt that this did not really show off what Zengo was – and on hindsight should’ve ordered something else – and would do so next time. The husband went for grilled sea bass (150 AED), served with roasted pepper and asparagus dashi stock, pickled onion and bonito flakes. Again, another well-priced main, and one that we do recommend. 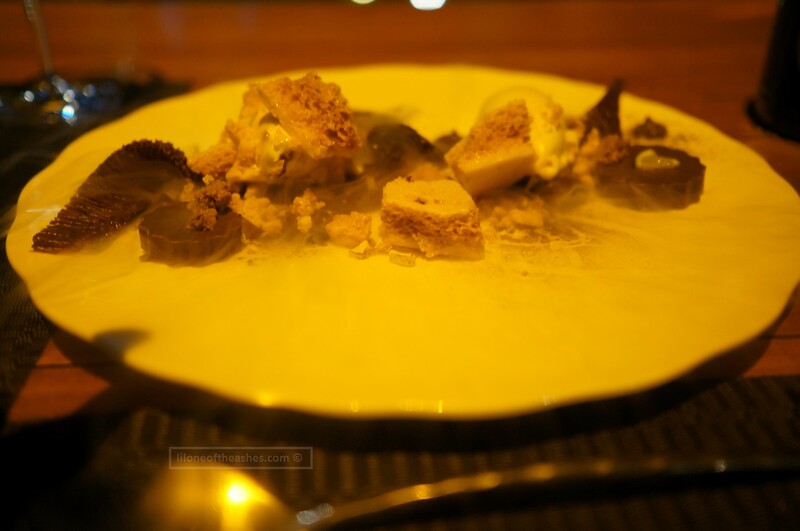 We finished the evening with their desserts to share, called the “pralus bio equateur” a selection of dark chocolate pudding, honeycomb cake, peanut plantain and honey ice cream. Served to table with an impressive buzz of liquid nitrogen (I’m loving this liquid nitrogen thing….!) It’s a bit of a shame that the lighting didn’t give the food enough credit – there was a huge orange spotlight above us (evidently) – and ah, their dark chocolate pudding was thick, not too sweet, and together with a bit of everything else served, a good finale to the evening. Dinner for two at Zengo (similar to ours) would come to around 700 AED per couple, and together with a bottle of wine would tip to to easily 900 AED. It is definitely to be saved for a romantic dinner, a special occasion of sorts, especially in such a beautiful setting. As far as asian fine dining goes, I would recommend Zengo, and put it on par with Toko and possibly Katana (sorry, Zuma didn’t really impress me on our one-time visit). Though expensive, it is reasonable for the portions that you get, and the menu has been well created using various asian ingredients. On suggestions? I could not find any fault on our evening – service and all, though it is to be noted that this was a review so I would be keen to check it out on another night at our own account and provide recommendations then. On deals – they are not in the Entertainer or similar, though every Tuesday, Zengo does ladies nights with 3 complimentary drinks and 50% off when dining in group of girls, or 25% when dining in mixed groups. It’s very uncommon for GHH and LRM to offer deals so I do recommend that you organise a get-together there on Tuesday and try the new menu out, over a few cheeky drinks 🙂 And yes, I will be back on a Tuesday! Do go and let me know how it is! Disclaimer : We were guests of Grosvenor House Dubai for the evening. Thoughts are our own, though it is entirely up to you to judge.